Tore Stole leads Confluence’s market research efforts and chairs the firm’s Equity Investment Committee. His research coverage includes Materials, Industrials and Consumer Staples. Before joining Confluence, Tore spent the prior 18 years as an analyst with A.G. Edwards & Sons, Inc., the last eight years of which were with Gallatin Asset Management, the investment management arm of A.G. Edwards, Inc. Tore was part of the portfolio management team responsible for Gallatin’s value-oriented equity portfolios. His coverage was primarily focused on Basic Industries, including chemicals and forest products, as well as the Food & Beverage sector. Prior to joining the Asset Management division, Tore served as an equity analyst covering the pollution control, chemicals and paper & forest products industries. Tore has more than 30 years of experience covering stocks, starting in 1985 with Milwaukee-based Blunt Ellis & Loewi before moving to The Chicago Corporation. 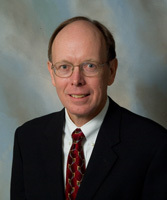 Tore earned a Master of Business Administration from the University of Chicago and a Bachelor of Arts from the University of Illinois – Urbana.